Two years ago, I wrote an article for this newsletter detailing my experience with PA. At that time, I indicated we had just sent fibroblasts for mutation testing in an effort to help determine if my husband, Tim, was a carrier for PA as we were making decisions regarding having children. Thankfully, after almost a year, the test results came back showing that he was not a carrier. Thus began a journey that resulted in the birth of a beautiful baby girl, Grace. My pregnancy brought with it both the expected as well as the unexpected. Although I have enough specifics to fill most of this newsletter, for time’s sake as I have a little one lying on me (who will want to be fed soon), a (relatively) brief summary of my experience follows. ​Like many pregnant women, I experienced morning sickness throughout the first trimester. However, unfortunately, this didn’t end then but rather continued for the rest of my pregnancy. In addition to the usual remedies for combating morning sickness, I was given Zofran ODT. The orally dissolving tablets acted immediately to counteract the nausea and prevent vomiting as the potential for metabolic crisis would increase with continued, frequent vomiting. I knew all aspects of the pregnancy would be closely monitored but I was surprised, both pleasantly and unpleasantly at what this brought. Although I did everything I was supposed to, I was still impressed at how good my metabolic labs really were; I don’t think they have ever been that good. Granted, at times results were low or high necessitating a change in therapy. Most of these changes were expected as the pregnancy progressed to provide enough nutrition for Grace. An ultrasound at 18 weeks showed bilateral choroid plexus cysts and suspicion for a VSD (ventricular septal defect) which, if present, increased the risk the fetus had a chromosomal abnormality. At this time I opted for an amniocentesis to determine if such an abnormality was present. Since an amniocentesis was being performed, we chose to have extra amniotic fluid collected and sent off to have PA status of the fetus determined. Thankfully, all results from the amniocentesis came back normal. Four weeks later, another ultrasound elicited concern for IUGR (intrauterine growth retardation). Although on paper I should have been getting adequate calories, I increased intake nonetheless. After all, it couldn’t hurt… only help. I expected the toughest part of the pregnancy for me would be to eat enough calories and protein for adequate growth. What I didn’t expect was just how tough it really was. At any time throughout the day, I knew how much protein I had consumed and how much was left. The need to eat more than usual and on a consistent basis was extremely difficult and only complicated by my nausea. To meet increasing needs of the fetus without consuming more than my body could handle, I began taking a medical formula as well at the end of the first trimester. The amount needed was increased throughout the pregnancy. As my mild condition has not necessitated the use of such a formula when in a non-pregnant state, starting this, while nauseous, was perhaps the most challenging aspect for me. Needless to say, the taste left more to be desired. I am happy now to look in our refrigerator and, when I see the formula container, know that it is Grace’s formula to take and not mine. If any formula company representatives are reading this, I would be glad to provide some input for suggested improvements! I am hoping some changes in regard to medical protein options available by the time we are ready to do this a second time. Given the risks involved, plans for delivery were formulated early on. With the efforts of those involved, I expected a well-controlled delivery likely earlier than 40 weeks. However, I did not expect delivery to occur at 31 weeks. This followed admission to the hospital at 30 weeks with preeclampsia which significantly worsened over a week and resulted in a c-section. Despite the fact that it occurred earlier than planned, the careful planning and attentiveness to detail of those involved resulted in a delivery that was well-controlled. At 1:03 AM May 24, Grace was born. Weighing only 2 lbs, 9 oz and 14 inches long she was immediately taken to the NICU (neonatal intensive care unit) while I was taken to the ICU for post-partum monitoring. Eighteen hours after she was born, I finally got the chance to meet my daughter. Because of medicine given upon my admission to speed up maturation of Grace’s lungs, she did not require any respiratory assistance after being born. (And, as anyone who has been around her when she is hungry can attest, her lungs work more than well!) She remained in NICU for 7 weeks, primarily for feeding and growing. Weighing over 7 lbs, looking at her now it is hard to believe she was a preemie. 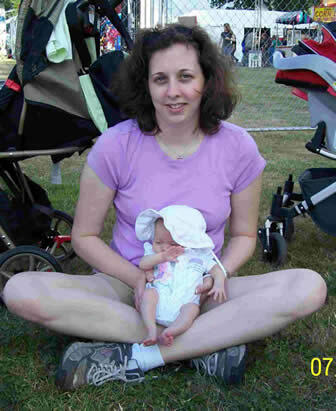 The success of this pregnancy was in large part due to the exceptional care I received. The importance of a good perinatologist (high-risk OB) and metabolic team cannot be underestimated. In my case, I was fortunate enough to have the best in both specialties. To Sally Segel, perinatologist at Oregon Health & Science University and to Jon Wolff, Sandy van Calcar and the rest of the metabolic clinic at the University of Wisconsin Waisman Center – thank you for all you did to ensure the best outcome of life’s most precious gift. Yes I had to eat more than I ever wanted and work through nausea every day but I couldn’t have done it without you. I look at Grace everyday and think about how fortunate she and I were to have your expertise to guide us through this journey. We are truly blessed in many ways; you are just one of the many. We pray she will continue to thrive and look forward to celebrating both life’s big and small milestones with her. There have been numerous times I have considered writing for the OAA newsletter but one of life’s other distractions always seemed to take precedence. Finally, after much unintentional procrastination, I am sharing my story. In many ways it is similar to others featured in this newsletter over the years; in many other ways, my story is truly unique. Born March 3, 1978 to Thomas and Diane, I was the first of four girls. Aside from the usual momentous occasions of my first step, first word, etc., my first few years were relatively uneventful. That all changed in May 1982. Vomiting and lethargic, my parents initially thought I had a case of the flu. Twenty-four hours later, my vomiting and lethargy continuing, I became progressively more weak. First-time parents and unsure what else to do, my parents took me to the emergency room of our local hospital. There, a battery of tests were run, none of which provided an answer. I was transferred to the University of Wisconsin Children’s Hospital. At the time of my admission to the pediatric ICU, I was comatose and in metabolic acidosis. Additonal lab work, an EKG and EEG among other tests were performed. Still, there was no diagnosis though three causes were proposed: Reye’s Syndrome, a metabolic disorder, or poisoning. As my condition began to improve within 24 hours of starting IV fluids, Reye’s Syndrome was ruled out. Although never formally ruled out, my parents must have looked distraught enough that poisoning was an unlikely possibility; the hunch was it was a metabolic disorder. In an attempt to prove it was metabolic, they decided to load me with high amounts of protein in an attempt to put me into metabolic acidosis once again. This was unsuccessful, likely due to my mild condition and the fact that it had taken me four years for metabolic acidosis to occur the first time. So, although lab work indicated propionic acidemia, my parents did not have a definitive diagnosis at the time of my discharge. Ten days after discharge, I returned as an outpatient to the Biochemical Genetics Clinic at the Waisman Center in Madison, Wisconsin for a skin biopsy for definitive diagnosis. My skin cells never grew; the final diagnosis was based on lab work. Since diagnosis, my propionic acidemia has been relatively well controlled. Though none in recent memory (12+ years), I have had to make a few trips to the emergency room for IV fluids but have never been admitted. The most memorable was a time we were camping in northern Wisconsin. I had been vomiting and spilling ketones for a couple of days. We went to the ER and my mom, a registered nurse, informed them of my medical condition and what needed to be done, but they would have none of it. They proceeded to test functionality of almost every organ you can think of. Unable to find anything else wrong, they finally relented and believed what we had told them when we came in! I am able to catch any problems early on; once I start vomiting, I am diligent about checking ketones. If I start spilling ketones, I am quick to go to the emergency room knowing it is unlikely they will improve on their own. In many respects, the low protein diet has not been too difficult for me. I have been fortunate that I do have a fair amount of enzymatic activity. Because of my mild condition and age at the time of diagnosis, I have never been on a low protein formula. My initial treatment was a low protein diet and biotin supplementation. Even before my diagnosis, I did not consume much meat or milk. Even now, those are not foods I generally crave. Growing up in Wisconsin, cheese has been my biggest nemesis! Most of my friends throughout school were not even aware I had such a condition that restricted my diet. When we went out to eat, I would often order the same thing as everyone else. To compensate, when I was at home I rarely ate any amount of high protein foods. My current diet has not changed all that much. I still do not each much protein, especially when I am at home, but splurge more when we are out to eat. I do not formally count grams of protein; at this point, I just try to limit high protein foods as much as possible and use common sense. If I know I have eaten a lot of protein one day, I make sure to back off the next. When I am ill, I am extra careful to limit my protein intake and take the full amount of carnitine. In addition to a low protein diet, I also continue to take biotin (10 mg/day) as well as a multivitamin with minerals, additional folic acid, and additional calcium daily. Ten years ago, my sister witnessed me having a seizure. That was the first and last one I have ever had. Though the cause was never determined, I have continued on dilantin (300 mg/day) since we are unsure if the seizure was related to propionic acidemia. I will certainly admit that at times, it has been less than desirable to have this metabolic disorder. Although I have been blessed with a mild case, I can relate to some of the frustrations I have read about others experiencing – most notably the fish odor associated with carnitine. This single issue has probably been my biggest struggle coming, no less, during the already awkward teenage years. Most frustrating is that I cannot smell the odor myself, leading me to rely on my close friends to let me know if I was the cause any time I heard a comment in school related to a fish odor. I can’t even count the numerous times I remember thinking “I hope they are having fish for hot lunch today” to explain the smell. Since then, my carnitine intake has consistently been suboptimal as evidenced by lab results. I have been trying to improve on this but it hasn’t been easy. Despite the frustrations that come with having a genetic condition, having propionic acidemia has enriched my life in many ways. While an undergraduate at the University of Wisconsin, I spent four years working in a variety of capacities in the Biochemical Genetics Clinic and began to more fully appreciate all that goes into diagnosis and treatment of the many metabolic disorders. Although I knew I wanted to pursue a career in healthcare, it was really my desire to work as a metabolic dietitian that spurred me to declare dietetics as my major. In May 2001, I graduated with a Bachelor of Science in dietetics from the University of Wisconsin followed by completion of my dietetic internship and Master’s Degree in August 2002 and January 2003 respectively, graduating with a 4.0 grade point average. My internship and graduate program were chosen based on the pediatric and genetic opportunities they afforded me. Every presentation I gave and paper I wrote focused on pediatrics and genetics. Since then I have worked as an inpatient clinical dietitian, first as a generalist and later with a pediatric emphasis. I was always mindful of capitalizing on opportunities that would further position me to be the best candidate for a metabolic dietitian position when the opportunity arose. Earlier this year, my goals and dreams were realized; I am currently one of two dietitians working in the metabolic clinic at Oregon Health & Sciences University. It is great to be back in the field. In addition to my personal interests as well as my aptitude in biochemistry and genetics, one of the things that appeals most to me is that it is an always changing field that continually provides new challenges. Even though I have only been away from a short time and despite my best efforts to keep abreast of new developments, I am still amazed by all that has changed in the past four years. Discussing my condition with others has never been much of a problem for me. I am open to sharing my story and answering questions with anyone who will listen. There are so many people, health professionals among them, who have never heard of propionic acidemia much less know what it is. At first, it was frustrating but now I rather relish it. I see it as an opportunity to educate others not only about what the condition is and what it means for those affected but also why there is such a need for all states to expand newborn screening to include propionic acidemia. One of those people who got a crash course in genetics and metabolism was my now-husband, Tim, a technically-oriented engineerJ . I am often asked how I have dealt with propionic acidemia in my relationships; I can honestly say that it has never been an issue. Like I am with everyone else, I was open and honest the first time Tim and I went out; looking back I am surprised I did not scare him off! I have been truly blessed to have found someone who has accepted and loved me for who I am, propionic acidemia and all. On July 23, 2004 Tim and I were finally married! As I look back on my journey with propionic acidemia, I realize how much my life has come full circle. Tim and I have had many discussions with a genetic counselor regarding our options for carrier testing. What has been most frustrating is the lack of options. Although amniocentesis is available for prenatal diagnosis as is specialized genetic in vitro fertilization, they are not acceptable options for us based on our religious beliefs. What we really desired was determination of Tim’s carrier status which would allow us to make an informed decision about whether to have our own children or to adopt some of the many in need of a loving home. We have been fortunate (I have used this word many times but we truly have been blessed in many ways) in that a researcher in Spain has agreed to do carrier testing for us. The first step in the process is for a skin biopsy to determine the location of my mutation…the same skin biopsy that failed to grow skin cells 23 years ago. Here’s hoping that this time around it is a success! We recently moved to the Portland, Oregon area and have enjoyed making our new house “home.” We also enjoy ballroom dancing, traveling, cheering on the Wisconsin Badgers and spending time with friends and family. Although I hope they know how much I appreciate their personal friendships and professional expertise, I am eternally grateful to the staff at the Waisman Center – Jon, Susan, Sandy, Sally, Punky and Peggy. Thank you for always taken my concerns seriously, answering my many questions, providing with valuable professional experience and sharing in my many ups (and thankfully few downs) along the way. And to my current professional colleagues at OHSU – Bob, Cary, Dave, Kathleen, Sylvia, Linda and Lori – thank you for giving me the opportunity to realize my dream to give back to others so much of what has been graciously given to me.